A new initiative to encourage and support the take up of robotics technology within industry across Europe has been set up at the Bristol Robotics Laboratory (BRL). The Robotics Innovation Facility (RIF) based at BRL is part of the ECHORD++ project, a €20 million initiative funded by the 7th Framework Programme for Research and Technological Development. There are three RIFs in Europe. The Bristol RIF is the lead institution – the other two RIFs are based at SSSA, Pisa in Italy, and CEA, Paris in France, launching in January. Bristol acts as the clearing house for the projects to be allocated to the most suitable centre, and there is a small fund to support travel and subsistence for the project duration. 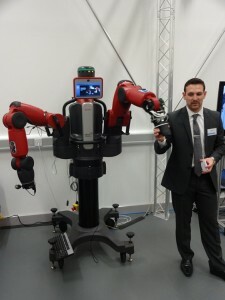 The Bristol RIF aims to stimulate the interaction between robot manufacturers, researchers, and end users, by providing free access to robotics equipment and experts. Technical support is provided by a dedicated RIF team, with additional assistance from engineers and scientists within Bristol Robotics Laboratory. The projects can be about control systems and electronics as much as robotics and software and the project will run until 2018. The RIF acts as a gateway for business, especially SME’s, to help them work with new robotic technologies; develop markets for new robotic products, services or processes; demonstrate proof of concept in novel robot application areas; and develop new value chains in existing and emerging sectors. Projects can have up to 6 weeks of support with equipment and engineers. This can be extended if the project needs it. “SMEs, other businesses and manufacturers can sometimes find it difficult to access the latest technology, and understand the potential of robotics and how future deployment could help their business. For example, companies frequently have a product or process idea or improvement but can’t take it to the next stage within their current capabilities,” said Farid Dailami, who heads the Bristol RIF. “A company may hear that an expensive robot could help their production capacity, but they are unable to access the equipment or software that would allow them to verify this before investing significant time and money in a new system. Through the RIF we would be able to carry out the necessary experiments and modelling to help them understand possibilities, and resource permitting, support them in getting extra funding to continue development. We can also introduce companies to national and Europe-wide networks beneficial to the development of their innovation and ideas.